Do you have one of those apps on your smartphone that teaches you a new vocabulary word each day? Here’s one for you: “parquetry”. These are the block patterns used in wood flooring made up of angular geometric shapes such as squares, diamonds, and triangles. They often feature multiple species of wood or different stains to add even more visual interest to the floor. That depends on who you ask. A plain checkerboard pattern might look a little dated. 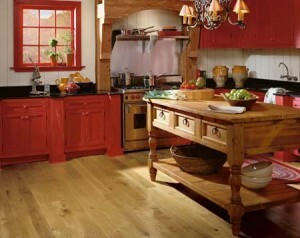 But there are also many modern designs you could choose for your floor. You could even use parquet as an accent rather than for the entire home. For an even more customized look, talk to our pros about designing a medallion or other decoration to add flash to your floors.